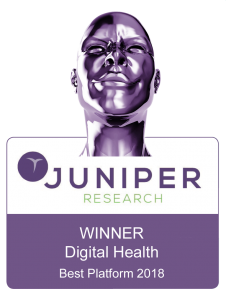 We are delighted to announce that BPMpathway has been named as winner of a Juniper Research Future Digital Award For Innovation & Commerce 2018. The Future Digital Awards honour companies at the forefront of new developments across an array of leading technological categories. BPMpathway triumphed in the category of Digital Health – Best Platform/Technology 2018. The Future Digital Awards are given to companies that Juniper Research believes have made outstanding contributions to their sector during the previous year and are now poised to make a considerable market impact in the future. Previous winners include Microsoft, Google and IBM. The awards are decided by a panel of expert judges based on a number of criteria, including product features and user benefits, innovation, commercial launches, certification and compliance and potential future business development. Juniper Research provides research and analytical services to the global hi-tech communications sector, delivering consultancy, analyst reports and industry commentary. Click here to read the full press release.